Checking in on the blog and going to use some lame excuses as to why I haven’t been contributing too much to ye old blog. So I’ll list my lame excuses in hopes the story behind them will produce meaningful content. Yea! I mention this because it’s a interesting history between Sam & Max on the Wii and me. Back in Aug 2006, a few of the various staff at Telltale were mentioning how point & click games, including Sam & Max, would be great for the Wii. No plans to do so, just that the idea of going to the platform would be nifty. Obviously this lead people to think Telltale was actively developing for the Wii. This rumor propagated. Emily decided to make a post about it to curb the rumor and set facts straight and state while it’s a desire, they need Nintendo’s support to make it happen. A link to Nintendo’s contact page was made. When I saw this post, I wrote up a form letter for people to use. About 3 hours later, Emily updated the post saying Nintendo contacted Telltale and to stop sending e-mails. Between that time and now, Telltale created a Wii game… for CSI: Hard Evidence. The development of the Wii port was the entry way to working with WiiWare (read on) and the Sam & Max port. Now we’re public about the development of the Wii port and I’m apart of the team making it happen. Funny how these things come full-circle. While I certainly aimed to be working in the industry (or attending grad school at USC) by now, I wouldn’t dream that I’d be working on that port. Well, I did dream of it, but actually I wouldn’t think I’d be actually working on it for reals. 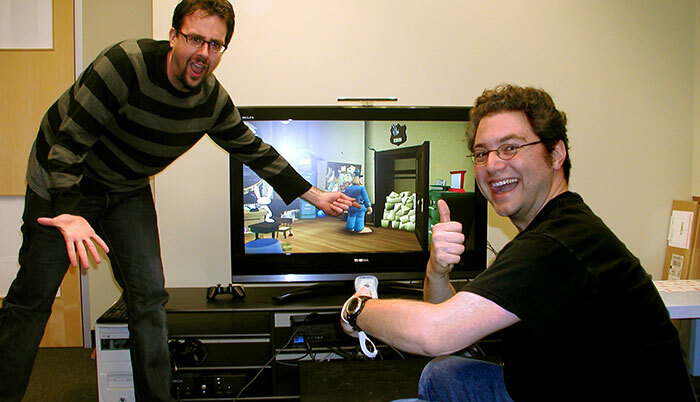 Let along being pictured in the press release announcing the Wii port. Yup, working on the Strong Bad game! It will be for WiiWare and later Windows with five episodes. We had a big work push for two week running up to the announcement so we would have a strong showing and demo running for Nintendo’s media showing. Not a crunch time, but a lot of effort was put into making something showable for the press. Not much else I can add but for what’s already been said between the press releases and the website for the game. As thing progress on I’ll be sure to add my thoughts in. 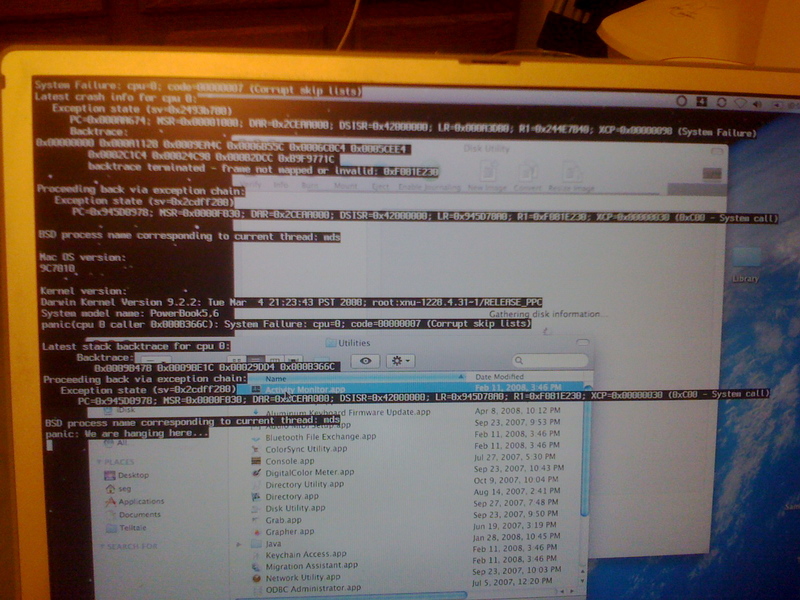 This photo was with my attempt to run Disk Utility on the lappy, which was my sign to give up a normal repair. Booked an appointment at my local Apple Store and spent the night attempting to back up my data since my last backup in late Jan. Lucky for me, my AppleCare is set to expire 2.5 months from now, so I see this as a final support pass for the computer. Got the laptop back on Tuesday with a review of the damages and repairs (all for free). First, the hard drive was gone and replaced with a working one. Considering my laptop has been running almost non-stop for 2.8 years, I’m surprised the drive lasted this long. Second, they replaced the motherboard but didn’t state the problems why. Lastly, the tech said that my third-party RAM chip was broken and provided a new 512mb RAM stick. I did try the old stick again, and the resulting crash lead me to believe the tech told the truth. After ordering a new 1GB RAM from NewEgg, I was still getting a few problems. After doing a reinstall of the OS, things are back to normal. The whole situation caused me to loose a few iTunes songs, and all my saved RSS feeds. Otherwise I’m doing good with my laptop. Besides the shaky reinstall of Mac OS X, I’m very happy with the service from the AppleCare. I actually plan on getting a new Apple laptop so I can ride the Intel Apple bandwagon. My plans are to give my current Powerbook to my father when I’m done with it, so it’s kinda a good thing that this computer went through an Apple support pass. It’s a good computer, but I want to work on iPhone apps and be able to do work stuff using Windows-only tools. Defiantly a MacBook Pro 15″ as I need a real graphics card (NVIDIA GeForce 8600M GT @ 512mb). Anyone willing to offer a good deal on a new one? I decided to try something a bit more personal with this post than sticking only to deep subjects. Not to diminish the topics, but an effort to put a bit more personality to this blog. Thoughts?